Westley is a posh western suburb of Bury St Edmunds, and it has a quite incongruous little church. Even odder, perhaps, is that it made it into the Sunday Times a few years back after I described it here as having ' the stiffest door lock of any church in England'. That august publication, in a review of this site, obviously thought this was one of the more significant things I had said about the churches of Suffolk. In return, I quoted their review in full, but a few months later I received an e-mail in grim officialese from one of Rupert Murdoch's henchwomen, pointing out that republication of material from Times Newspapers without a licence was a breach of copyright, and that I had 48 hours to remove it. I wrote back immediately, in what I thought was a charming manner, suggesting that my reproducing their review of my website on that very website was not an unreasonable thing to do, but they never replied. I am not one to bear a grudge, but to this very day I have never again bought a single copy of anything published by the Murdoch Press. Be that as it may, it was good to come back to Westley on a day of bright sunshine. The affair of the stiff key had happened back in 1999; I had got it from a nice lady at the other end of the village, and she had explained carefully to me, as if to a small child, how to open the door. Well, I stood struggling with the blessed thing for about ten minutes, but could I get it open? It just wouldn't budge. In the end, I took the key rather sheepishly back, hoping to obtain further instruction - but the lady had gone out, so all I could do was pop it through her letter box and slink off to Little Saxham. Having visited well over a thousand churches since I was last in Westley, I thought there was a fair chance my technique would have improved, and that this time I would be able to get it open, even if it did mean struggling manfully for ten minutes. It also occured to me that, having made the national press, the parish might well have installed a new lock, or at least applied lavish quantities of WD40 to the old one. As it was, none of these thoughts were relevant, because I found the church open. St Mary was built in 1836 out of concrete, in an obstensibly Early English style, but the spire had to be removed in 1960, and with its squat little stump it looks like nothing so much as a church from an Italian hill-top village. The exterior cement had got rather ugly over the last few years, with its plaster cracking and falling off, but it has now been replastered and repainted, and is gleaming white and thoroughly bellissima. Incidentally, the parish claims that this is the oldest concrete church in England, although I believe that there is another church in Lancashire which makes the same claim. By a year's grace it is of course a Georgian church rather than a Victorian one, a rare thing for Anglican churches in Suffolk. 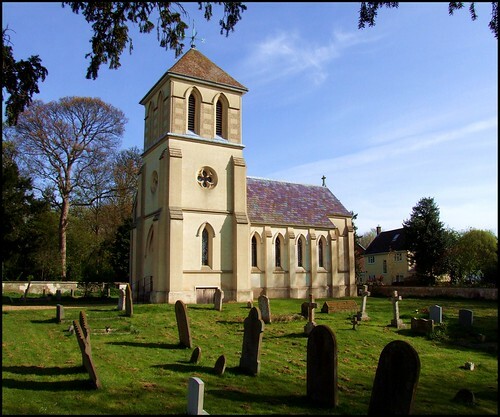 It was built to replace the church of St Thomas of Canterbury, which was badly damaged by a tower fall in 1744, and eventually abandoned. The new church was built on this hilltop site by the Marquis of Bristol, simply because he wanted to have something to look at from his Ickworth home while he ate his breakfast. Being a great fan of European travel, he would probably approve of the way his church looks now. Inside, the church is simple and functional, as you would hope and expect of the Georgian period. The only detail of note is the royal arms of the House of Hanover, carved in wood and plaster. It must have been one of the last sets in England. On the wall nearby is a board detailing the building of the church, and a simple contemporary font sits at the west end, again one of the last pre-Ecclesiological examples. On this day of bright sunshine the lancet windows filled the interior with slats of sheer light, casting across the dark furnishings with a thrill of the numinous. And if the Sunday Times wants to quote me on that, they'd better ask me first.